Make it a daily activity—ASK! Now to drill a bit deeper. 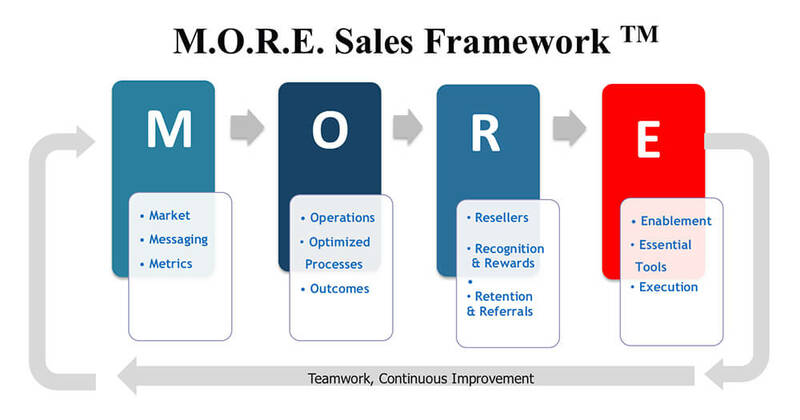 Are you accelerating sales in the most efficient way in your company? Don’t overlook the fastest path to growing sales – your current customers! Many companies focus, in some cases exclusively, on new customer acquisition – and that’s essential when you are working in a greenfield territory or market. You have to start first by acquiring new customers – but your focus should be equal to or greater on providing exceptional service and delighting your customers – after the sale! Doing so will lead to the fastest ways to grow your revenues – expansion in existing accounts and referral selling. The key is to first land your customers, no dispute there. But the key is not to move to the next customers without continuing to focus on the customers you just landed. The key is to meet the outcomes that your customers purchased and expect to achieve. The key is to meet those outcomes, resolving the pain they purchased your solution to alleviate, and meeting the KPIs they partnered with you to deliver. It is important to deliver exceptional customer service and customer delight as the foundation of your relationship with your customer. How much business is being lost due to poor service – billions or trillions? Those are two incredibly powerful and disparate quotes. The statistics are overwhelming in either case! Excellent customer service is the foundation for additional business. In this new world of subscription-based and cloud-based solutions, social media, always on media, information overload, and lots of competitors all vying for your customer’s business, you must provide exceptional service. The stats alone tell the story. To expand your wallet share, a solid foundation must be built. Excellent customer service is absolutely the bottom line. Once you are delivering exceptional service, you have earned the right to expand your business. Have you heard that it costs 5X more to sell to a new customer? I’ve also heard 7X and 9X, and I’ve even heard 25X. Have you heard “On average, loyal customers are worth up to 10 times as much as their first purchase3 ”? The key to growth is expanding your current base – not only do they have a lower cost of acquisition, they are more likely to buy, and they are more likely to buy more than a new customer! N – You must listen to your customers and act on their feedback. Conduct NPS and Customer Satisfaction Surveys. D – Delight your Customers Daily! Once you’ve provided exceptional customer service and you are delighting your customer, you can ask for Referrals. Referral Selling is the MOST efficient way to acquire NEW Customers. Embracing the elements of the Land and EXPAND Sales Framework will not only expand your wallet share in existing accounts, but you will also drive new business in new accounts. From high tech companies to healthcare, to banking to legal, to service companies, and more, the Land and EXPAND Sales Framework exhibits the key areas to expand your business. What are the elements of the Land and EXPAND Sales Framework? Let’s start with the “E” in EXPAND. Excellent customer service is the foundation for additional business – for both expanding existing business and acquiring new business. Companies and sales reps who embrace this key element have a higher probability of both short-term and long-term success! In this new world of software as a service, subscription models, cloud anywhere and everywhere, social media, always on media, information overload, and lots of competitors all vying for your customer’s business, you must provide exceptional service. To expand your current customer base and receive referrals from those customers, there is one basic tenet, one sure fire way to accomplish both – create an exemplary customer experience. The next element, the “X” of the Land and EXPAND Sales Framework, is generating expansion revenue with cross-sell and up-sell opportunities. Understand your market and your customer’s additional needs and how to help them solve them, as well as or better than the competition. Focus on ways that you can expand your footprint by assisting your customer in solving additional business problems. To solve additional business problems, first, you need to map what the customer is using today, what their incremental needs are, and what else you might offer to fit their needs. Map all of your solutions deployed, and not deployed, within your accounts – this is also known as mapping the white space – of potential opportunities. Once you see where the gaps are, you can up-sell and cross-sell your other solutions. There are many methods to offer up-sell and cross-sell opportunities or campaigns to your customers. One method is via one-time Promotions and ongoing Programs. The “P” element of the Land and EXPAND Sales Framework is to get the word out in the form of promotions and programs. You want to make your existing customer base aware of the additional problems you can help them solve. You need to deliver ongoing messaging often in the form of digital or content marketing or social media to communicate how you can address key business problems and solve them more creatively and effectively by offering better service and support, with uniquely differentiated solutions. Your differentiation might even be in the form of delivering more creative promotions and programs than your competition. Promotions and programs run the gamut from buy one, get one free, buy at a special discount, bundled offers, try it / buy it programs, early adopter programs, loyalty programs, reseller programs, user groups and customer advisory boards, plus many others. 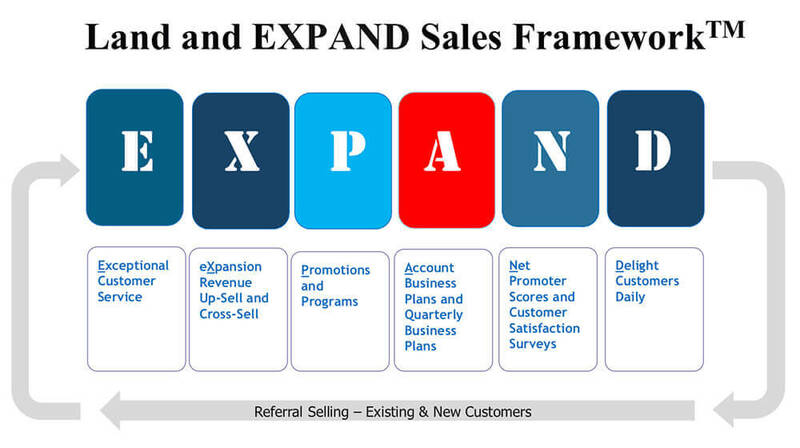 The “A” element of the Land and EXPAND Sales Framework includes Account Plans and Quarterly Business Plans. On an ongoing basis, you need to gather continuous intelligence around your customer’s business so that you can better understand and fulfill their needs. There are two keys ways to better understand your customer’s business – Account Business Plans (ABPs) and Quarterly Business Reviews (QBRs.) Account Business Plans give you an overview of your account to ensure you have a more thorough understanding of your customers, what their key initiatives are, and where you can better support them. Quarterly Business Plans are conducted with the key stakeholders of your accounts and has the benefit of positioning you better than the competition as a strategic and trusted advisor. The next element of the Land and EXPAND Sales Framework is “N” – conducting Net Promoter Scores and Customer Satisfaction Surveys. Be sure to ask your customers to give you a report card on how you are doing! Ensure you ask your customers informally and formally what they think of your solutions, and how you are meeting and supporting their needs. Gather their feedback with BOTH Net Promoter Scores and Customer Satisfaction Surveys. Ask them how you are doing, and not only do something about it, be sure to communicate to them, your progress and commitment to their customer delight! Key is I am NOT removing the need to acquire new customers. You do need new customers! It’s just that many companies need to spend more time on retaining and EXPANDING their customer base than they are today. The last component of the Land and EXPAND Sales Framework is Referral Selling. And it relates to both existing and NEW customers! The most cost effective and highest probability of close of gaining new business and new customers is referral sales. And where do your best referral sales come from – from delighted customers where you are delivering exceptional service. What makes a healthy, sustainable business? What do investors want to see in assessing the value of a company? High retention rates, selling more to existing customers, and new customers. Embrace the Land and EXPAND Sales Framework and accelerate your results!